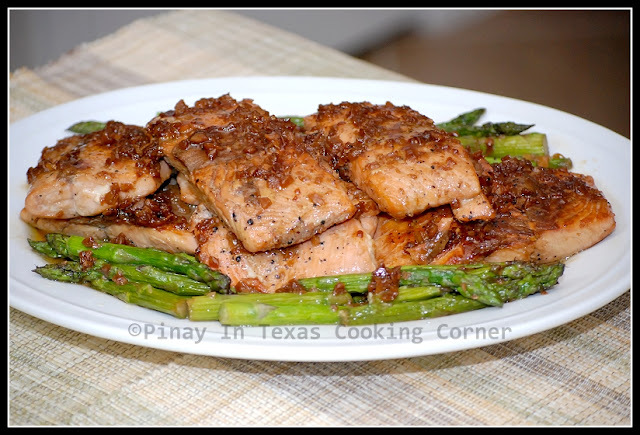 Salmon and Asparagus in Butter Garlic Sauce is a very simple recipe that I can call my own. I created this recipe in 2005 when we were just new here in Texas. Salmon became my eldest daughter’s favorite and she used to ask for it almost every day, hence the need to think of different salmon recipes. I originally cooked this with salmon alone. I’ve shared the recipe with some friends and they love it. I tried adding vegetables in it, and I found asparagus to be the best match. Since then, I usually cook it with asparagus. This is a very simple dish that your taste buds will surely love! Try it! 1. Sprinkle each salmon fillet with salt and pepper. Let sit for at least 15 minutes. 2. 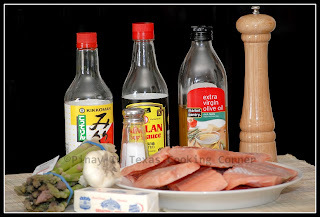 In a pan, fry salmon fillet until almost cooked. Transfer to a plate and set aside. 3. In the same pan, sauté garlic until light brown. 4. Add butter and allow to melt. 5. Add soy sauce. Mix well. 6. Add asparagus and simmer until cooked but still crunchy. Transfer asparagus to a serving platter and arrange on the sides. 7. Put salmon fillet in the sauce and simmer until cooked. Allow both sides to absorb some sauce. Don't overcooked salmon! Overcooked salmon is dry and shreds rather than flakes. 8. Arrange the salmon fillet in the middle of the platter. 9. Let sauce simmer for 3 more minutes. Pour over salmon and asparagus. 9. Serve hot with rice!